Kelly Slater "2002 Surf Champion"
Kelly is unquestionably the sports greatest champion. 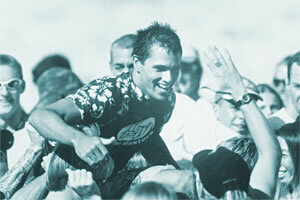 The winner of six (6) World Championships five (5) of them consecutively ('94-'98), the winner of five (5) Pipeline Masters Championships, the sports most prized individual crown, he recently won the Quiksilver in Memory of Eddie Aikau Big Wave Championship adding to his legacy. Although competing sporadically since his last World championship in '98 he is still considered the best surfer in the world today.